3:59 min. 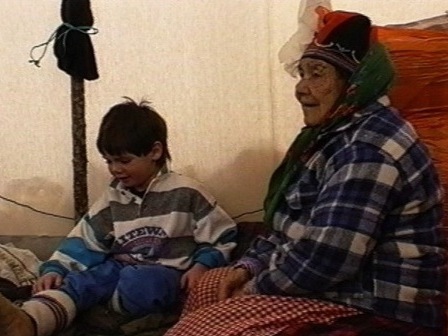 - On this guided tour, we learn that, following an invitation from his great-grandmother (Nukum) who lives in the bush, Messenak, who never knew his great-grandparents, questions his grandfather, Zacharie. Why this invitation? What surprises does Nukum have in store for Messenak? Messenak - That winter Mushum and I received an invitation. My great grandmother Nukum asked us to join her at her winter campsite. A week away from school! We left very early in the morning... It took us 5 hours by snowmobile through the forest to reach the campsite. I was so anxious for us to get there! Especially since Nukum had sent me a special message: she had an important surprise for me! When we stopped to rest I tried to get Mushum to give me some hints, but to no avail! I didn't know Nukum... I had never met her. She lived far from us and spent almost the entire year in the forest. Zacharie Bellefleur - Your great grandfather was a drummer... Among the innu this is a very respected task, as the drum is the messenger between people and animals. Messenak - Why was your father a drummer, Mushum? Did the elders choose him? Zacharie Bellefleur - It's the drum that chooses the drummer Messenak... Penashue dreamed of the drum that was the sign. Messenak - After supper, Nukum gave me a pair of moccasins. They fit perfectly. When I asked if this was her surprise, she didn't answer... She smiled mysteriously... When I heard the news from the radio that Mushum's brother and his wife were coming to visit, everything became more intriguing... Was it because of this air of mystery that I had such a strange dream that night? It was winter... I was ice fishing. I was trying to catch Kukumess, the large trout... I wasn't alone, there were many others fishing... Even Nukum was there. The drum resonated. Then all of a sudden I saw the eagle Metshu. He was very close to me. No one else saw him. Only me! Metshu was talking to me, but I didn't understand his language... Suddenly he disappeared. Everything changed and I was once again little and with my mother by a fire. You need the Adobe Flash Player to view the above movie. Adobe Flash Player can be downloaded from Adobe. Magnifique, vous nous transportez jusqu'au bout du territoire, jusqu'au coeur du rêve de Messenak. Bravo! J'aime beaucoup votre culture. Je vis en Outaouais et je suis allée visiter votre musée début juillet 2013 et c'était là un beau témoignagne. Surtout continuez d'exister. Vous êtes un beau peuple. Lors de notre visite, on nous a projeté sur un écran de 360 degrés un film que mon mari et moi avons trouvé génial. On aimerait savoir qui a fait ce film et s'il est possible d'acheter une copie DVD. J'aimerais le faire partager aux enfants de ma famille qui vivent en Europe pour les sensibiliser à votre cause. Nametau innu: Memory and knowledge of Nitassinan, a website dedicated to the Innu nation in which elders pass on their skills and knowledge to younger generations.